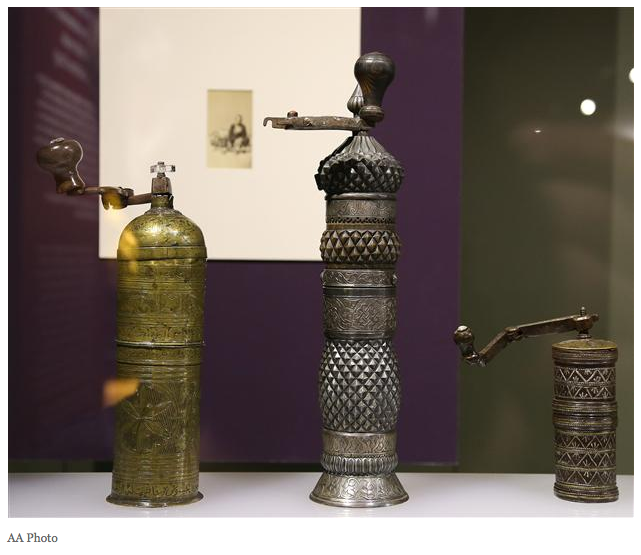 Istanbul’s Topkapı Palace Museum is hosting a new exhibition, featuring the 500-year history of Turkish coffee. Organized in collaboration with the Turkish Coffee Culture and Research Association, the exhibition, titled “A Drop of Pleasure: 500 years of Turkish Coffee” opened on Feb. 17 at the museum’s Has Ahırlar section with the attendance of Culture and Tourism Minister Ömer Çelik. Speaking at the ceremony, Çelik said Turkish coffee was an inevitable part of social life, not only of eating and drinking culture. He said Turkish coffee culture dated back to the 16th century, and it had particular importance in the Ottoman Empire, both in the palace and daily life, as socio-cultural event. “Beyond being a drink, coffee exists in the center of a big cultural structure. It also has a very important place in daily life. It used to be prepared and drank in coffee houses and movable coffee cookers. The coffee houses, where coffee culture had been surviving for hundreds of centuries, also hosted traditional Turkish arts such as shadow play, eulogy shows and theater-in-the-round,” the minister said, adding that coffee was born in Yemen and expanded west thanks to the Ottomans. He said the Ottoman Empire, which was dominant on the trade routes between the east and west, spread coffee and helped it be loved by Europeans during diplomatic relations. “For example, during his ambassadorship in Paris, humorist Süleyman Agha promoted coffee to French culture. When he was returning to the empire, his Armenian-origin assistant stayed in Paris and opened a coffee house. Another striking example is that after the Siege of Vienna in 1683, the first coffee houses were opened in Vienna with 500 sacks of coffee left by the Ottoman Empire. From then on, Europeans met real coffee culture,” Çelik said. UNESCO added Turkish coffee and its tradition to its List of Intangible Cultural Heritage in 2013. In this way, Çelik said for the first time the culture and tradition of a drink was added to that list. The exhibition “A Drop of Pleasure: 500 years of Turkish Coffee” consists of pieces from the Topkapı Palace Museum collections as well as the collections of many private museums and libraries. The show reveals the unique ceremony that Turkish coffee created in the Ottoman culture. Curated by Ersu Peki, the exhibition is the most comprehensive one related to coffee in Turkey and will be open through June 15. Most of the pieces in the exhibition are being displayed for the first time. It brings together historical, cultural and social elements of coffee, its botanic features and cooking methods in the world between the 16th and 20th centuries.